Two more fabulous challenges this week! The first .... another brilliant sketch from Midnight Madness and secondly .... a theme challenge at Passion For Promarkers of 'Girly And Glittery'. All products used are from Stampin' Up!, unless otherwise stated. Very nice card with such a cute image. Love the touch of sparkle on her. Very nice take on the sketch. The Midnight Madness Design Team thanks you for playing along with us this week. Gorgeos card Teri, Love the paper. I just ahve to get my hands on some of those Miss Anya stamps! Wow! This is super cute! The colors are SO good together and perfect coloring and sparkle! Thanks for playing along with us again this week! How sweet and adorable. Your colors are so cheerful and delightful. A very attractive Birthday card that is sure to impress the lucky recipient! Thanks for playing the MMSC challenge this week. Have a great weekend! Teri this is soooooo cute, love your colors and your coloring with promarkers is FANTASTIC!!! Adorable card! Stunning card. Lovely colouring and fabulously glittery. Thanks for playing along at PFP again. Oh how adorable your card is! you did a beautiful job with Anya. so so cute! What a fab job you did coloring Anya!! Beautiful colors and design!! Gorgeous creation. Thanks for playing with the MMSC this week! 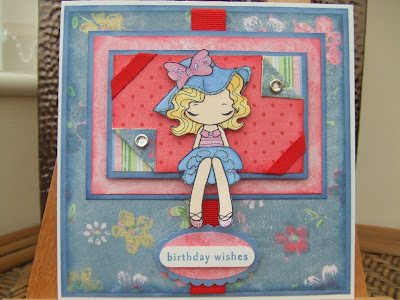 Gorgeous sweet card, beautiful cute image and fab papers. Teri this card is just adorable. I LOVE that image and paper that you used! Great card! Thank-you so much for your comments on my blog, I so appreciate it! She is adorable and you card is beautiful. The colors are so pretty together and your coloring . . as always is pure perfection! Lovely card! Stampin' Up! - Last Chance List!! !